Whether you are just beginning your college search, are considering applying, or are an admitted student, we encourage you to contact your Admissions Counselor to learn more about the amazing opportunities that await you here at Mason. Have general questions? Feel free to email the Office of Admissions at admissions@gmu.edu or call 703-993-2400. Have general questions? Feel free to email the Office of Admissions International Admissions staff at world@gmu.edu. Hello! My name is Dennix Averion and I am the International Admissions Counselor for George Mason University. I first came to Mason as an undergraduate student studying Marketing and Communication with a concentration in Public Relations. 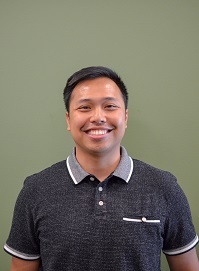 During my time as a student, I was highly involved with the Filipino Cultural Association on campus and worked as a student leader for FIND, Inc., a national nonprofit organization dedicated to the empowerment of young Filipino American college students. I greatly enjoyed my time at Mason and I am always excited whenever I get to share my experience with prospective students, especially international students! My experience working as an undergraduate student admissions assistant for Mason’s international recruitment team aided in my becoming passionate about higher education and working with international students. After completing my Bachelor of Arts, I transitioned into the Document and Credential Specialist role, evaluating international coursework for our international graduate applicants before making my way back to the international recruitment team in my current position. I love that my work has a hand in further developing the growing diversity and global understanding on campus. I consider myself an international student in my own right, being born in Manila, Philippines and immigrating to the state of Virginia in my formative years. I have firsthand experience in diving into a culture that was not particularly my own at first and understanding the uncertainty and excitement that comes with it. I was the first in my family to attend a US institution and had to learn how to navigate the intricacies of U.S. higher education for myself. It brings me great personal satisfaction that I am able to help international students learn about all of the exciting opportunities a US education can provide. Please feel free to reach out to me if you have any questions about Mason! I am more than happy and willing to help with the college admissions process. I look forward to hearing from you soon! Hello! My name is Meghan Walter and I am the Director of International Admissions at George Mason University. I grew up in Ossining, NY and came to the Washington, DC area for college. I double majored in Political Science and History for my Bachelor’s degree and received my Master’s degree in Public Administration; both degrees are from American University. During my junior year in college, I studied abroad in Prague, Czech Republic. This experience is what started my interest in international admissions! I had a wonderful experience living abroad and I want to help international students have a great experience here in the United States. Prior to joining the international team at George Mason, I worked at a law school in the DC area for the past 18 years. Through my years at the law school, I worked with both the JD Admissions Office and the Graduate Admissions Office. In these offices, I was the main point of contact for international students enrolling in the law programs. During this time, I was lucky to be able to recruit law student all over the world. Some of my trips included China, Belgium, Luxemburg, Czech Republic, Norway, Argentina, Uruguay, Chile, Peru, and Columbia. I am so excited to be part of the international team at George Mason University. I love working with international students and helping them through an admissions process that may a bit overwhelming. Please know I am here to help you every step of the way! I am looking forward to meeting students during my travels and to help them learn about all the great opportunities they can have here at George Mason University. Please feel free to reach out with any questions!